People sometimes ask Diane why she married a preacher. Her standard response is, “I didn’t; I married a janitor.” Don’t be hasty and think she’s commenting on Stephen’s preaching skills. Nor is she hinting at what preachers actually do at the church building outside of Sundays. A little over 25 years ago, when Diane and Stephen married, Stephen was working as a custodian for a public school district in California. Stephen’s night job helped pay for college. He wanted to be a high school teacher in everyone’s favorite subject—history. Stephen eventually did complete a Bachelor of Arts in History from California State University, Northridge. 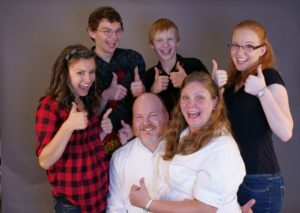 Along the way, Stephen and Diane were blessed with four children of their own (Sarah, Hannah, Adam, Benjamin), as well as three foster children. Their sojourn has taken them to ministries in California, Washington State, Michigan, and here in Liberty, Missouri. At one of those stops Stephen earned a Master’s degree in Ministry from Pepperdine University. He has also done graduate work at Cincinnati Bible Seminary. However, Stephen has always said the best Bible training he received was in an excellent Sunday School program when he was in grade school in Arizona. There is nothing “exciting” or intriguing about Stephen and Diane. They are just plain, down to earth people who like the simple things in life—being with family, enjoying God’s creation, and working with God’s family through the joys and trials of life.